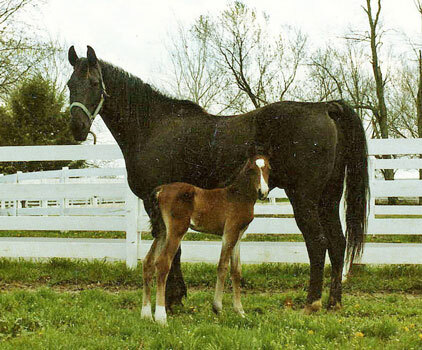 1993 Winsdown The Prize- 1993 Kansas Futurity Reserve Champion Amateur Weanling 1994 Arkansas Futurity Yearling Colt Champion, Colorado Fall Charity Yearling ASGN Champion, Oklahoma Futurity Reserve Champion Yearling Colt 1995 Ohio State Fair 2 year Old F/H Champion. 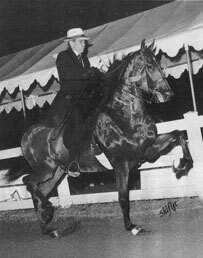 1996 Ohio State Fair UPHA 3 G. Champion 1999 IL State Fair Reserve Champion Novice 5 G., May Classic Champion Amateur 5 G., Lawrenceburg Reserve Champion 5 G. 2000 IL State Fair Reserve Champion 5-Gaited Stallion/Gelding. 2001 Shelby County Fair Champion 5 Gaited Show Pleasure. 1994 Winsdown Black Gold- 1995 Kansas Futurity Reserve Champion Yearling, Oklahoma Futurity Reserve Champion Yearling 1996 Kansas Futurity Champion 2 Year Old I-H, Oklahoma Futurity Reserve Champion 2 I-H, 2001 # 2 Futurity Sire (Saddle & Bridle) 2002 # 1 Futurity Sire (NH).Sire of Futurity Grand Champions Winsdown Three Rivers, Winsdown Industrial Ice, Winsdown Crystalline, Winsdown Iron Age, Winsdown Steel Barge and Winsdown Moonlight Rose. 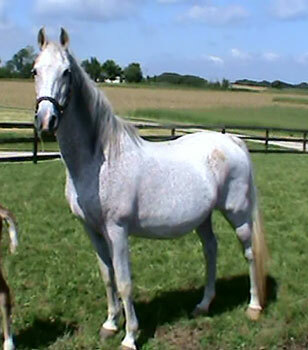 2003 # 1 Futurity Sire (S&B). 2005 Arizona Futurity Horse Show Amateur Model Champion. 1997 Winsdown Prudo Bay- 1998 Denver Queen City Champion ASGN Yearling, Iowa Champion Yearling, Oklahoma Futurity Grand Champion Yearling, Champion Yearling Filly, Champion Yearling Jackpot. 2001 Winsdown Forbes' Field- 2001 Iowa LTD 3rd. 2002 Grand Champion Yearling Missouri, and Oklahoma Futurities. 2003 Champion 2 Year-Old Fine Harness Iowa Futurity. Champion 2 Year Old Prospect Under saddle Texas State Fair Horse Show. 2005 Tambark UPHA Park Pleasure Champion. Great River Benefit 3 Gaited Show Pleasure Grand Champion & 3 Gaited Show Pleasure Junior Novice Champion. Des Moines Springfest 3 Gaited Junior Horse Reserve Champion. 2007 Des Moines Springfest Country western Reserve Grand Champion. 2008 Tanbark Hunt Grand Champion. 2008 Mid-States Hunt Grand Champion. 2008 St. Louis Hunt Prospect Champion. 2009 Des Moines Springfest Country Hunt Grand Champion and S&B Hunt Classic Champion. 2009 Tanbark Country Hunt Champion. 2009 Shatner Western Champion. 2010 Iowa Fall Classic Open Western Grand Champion. 2010 St. Louis S&B Shatner Champion. 2011 Central States Country Western Champion. 2012 Great River Benefit Country Western Grand Champion. 2012 Nebraska Charity Country Western Reserve Grand Champion and Country Western Champion. 2012 Des Moines Springfest Country Western Reserve Grand Champion. 2012 UPHA Chapter V Country Western Reserve Grand Champion. 2013 Mid-States S&B Hunt Classic Champion and Open Hunt Grand Champion. 2013 UPHA Chapter V Country Western Reserve Grand Champion. 2014 Mid-States Open Hunter Champion. 2015 Des Moines Springfest Open Hunter Reserve Champion and Open Western Grand Champion. Preferred's Gray Miracle- 2011 Iowa Fall Classic Park Pleasure Reserve Champion. 2012 Great River Benefit Park Pleasure Champion. 2013 Nebraska Charity Park Grand Champion. 2013 Des Moines Springfest Park Grand Champion. 2013 Great Rivers Benefit Park Grand Champion. 2013 Iowa Fall Classic Park Grand Champion.. 2014 Calvary Episcopal 3 Gaited Show Pleasure Adult Grand Champion. 2014 Central States Park Pleasure Reserve Champion. 2014 Iowa Fall Classic Park Pleasure Reserve Grand Champion. 2014 UPHA American Royal 3 Gaited Show Pleasure Local Grand Champion. 2015 Northeast Georgia 3 Gaited Show Pleasure Jr. Ex. Grand Champion. 2015 ETSA Mid-Summer Classic 3 Gaited Show Pleasure Jr. Ex. 14-17 Reserve Champion. Silver Penny- 2011 Iowa Fall Classic Country Hunt Grand Champion. 2012 Iowa Fall Classic Country Hunt Reserve Grand Champion. 2013 Iowa Fall Classic Country Hunt Champion. Champion Weanling Jackpot. 1999 Colorado Futurity yearling Grand Champion, Reserve Champion Yearling, Reserve Champion Amateur Yearling, Oklahoma Futurity Champion Yearling Colt. 2000 Champion Open and amateur 2 Year Old F/H CO Futurity Champion 2 Year Old Fine Harness MO Futurity Reserve Champion 2 Year Old In Hand and Fine Harness IA Futurity. Champion 2 Year Old In Hand KS Futurity. 2002 Calvary Episcopal Champion 3 Gaited Show Pleasure Adult Novice Rider. 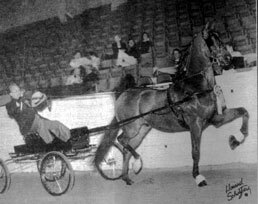 2004 Longview Champions 3 Gaited Country Pleasure & Tom Bass Classic Champion 3 Gaited Country Jr. Ex. 2007 Delaware Riding Club 3 Gaited Show Pleasure Reserve Grand Champion. 2008 Delaware ASB Model Champion and ASB Pleasure In Hand Champion. 2008 Twin Rivers ASB Model Champion and ASB Pleasure In Hand Champion. 2008 Buckeye Fall Open English Pleasure Grand Champion and ASB Model Champion and ASB Pleasure In Hand Champion. 2009 Delaware Model Champion. 2009 Twin Rivers In Hand Pleasure Champion. 2010 Blue Ribbon Fall Classic 3 Gaited Adult A/O/T Reserve Champion. 2011 Blue Ribbon Fall Classic 3 Gaited Show Pleasuer Adult A/O/T Champion. 2011 Ohio State Fair 3 Gaited Show Pleasure Adult A/O/T Champion. 2011 Springfield Charity 3 Gaited Show Pleasure Adult A/O/T Champion. 2011 Buckeye Fall Classic 3 Gaited Show Pleasure. 2011 Twin River Benefit ASB Pleasure In Hand Champion. 2011 Year End Award Winner. 2012 Delaware Riding Club 3 Gaited Show Pleasure A/O/T Champion and ASB Pleasure In Hand Champion. 2012 Twin Rivers ASB In Hand Champion. 2012 Heartland Classic 3 Gaited A/O/T Champion. 2000 Winsdown Vulcan Steel- 2000 CO Futurity Champion Weanling Colt & Reserve Grand Champion Weanling 2001 CO Futurity Champion Yearling Colt and Champion Amateur Yearling, Missouri Futurity Champion Yearling Colt, Oklahoma Futurity Champion Yearling Colt and Champion Amateur Yearling, Texas Futurity Champion Yearling Colt . 2002 Colorado Futurity Reserve Grand Champion 2-Year Old In Hand & Champion 2-Year Old In Hand Colt. 2002 Iowa Futurity Champion 2-Year Old Under Saddle. 2002 State Fair Of Texas Champion Pleasure Prospect. 2002 Texas Futurity Champion 2-Year Old Under Saddle & 2-Year Old Amateur In Hand. 2002 Salina Charity Champion Open Fine Harness Stallion/Gelding. 2002 Oklahoma Futurity Champion Amateur 2-Year Old In Hand. 2003 Champion 3 Year Old 3 Gaited Colorado Futurity. Reserve Champion Country Pleasure Driving Iowa State Fair. 2004 Reserve Champion Amateur F/H Missouri State Fair. 2004 WCC CH Jessie Cole (AKA Winsdown Jack Malone)- (Gray Gelding by The Gallant Confederate) 2008 N C State Championship Park Pleasure Junior Champion. 2008 Roanoke Valley Park Pleasure Junior Champion. 2009 Raleigh Spring Adult 3 Gaited Country Pleasure Grand Champion. 2009 J D Massey Adult 3 Gaited Country Pleasure Grand Champion. 2009 Asheville Lions Adult 3 Gaited Country Pleasure Grand Champion. 2009 Tanbark 3 Gaited Country Pleasure Grand Champion. 2009 Blue Ridge Classic 3 Gaited Country Pleasure Reserve Grand Champion. 2009 Wisconsin Futurity 3 Gaited Country Pleasure Grand Champion. 2009 Kentucky Fall Classic 3 Gaited Country Grand Champion. 2010 KSF WC 3 Gaited Country Pleasure Horse. 2010 The American Royal 3 Gaited Country Reserve Grand Champion. 2010 Tanbark 3 Gaited Country grand Champion. 2010 SHR Adult Country Pleasure High Points Champion. 2011 Bonnie Blue 3 Gaited Country Adult Grand Champion/. 2011 Des Moines Springfest 3 Gaited Country Adult Grand Champion. 2011 Mid-America Mane Event 3 Gaited Country Adult Grand Champion. 2011 Kentucky State Fair WCC 3 Gaited Country Adult and WC 3 Gaited Country Adult Div 1. 2011 Midwest Charity 3 Gaited Country Adult Grand Champion. 2011 Tanbark 3 Gaited Country Adult Grand Champion. 2011 UPHA American Royal National Champion 3 Gaited Country Adult. 2011 Year End Award Winner. 2012 Des Moines Springfest 3 Gaited Country Adult Grand Champion. 2012 Bonnie Blue- 3 Gaited Country Adult Grand Champion. 2012 Asheville Lions- 3 Gaited Country Adult 18-35 Grand Champion. 2012 Blue Ridge Classic- 3 Gaited Country Adult Grand Champion. 2012 Kentucky State Fair RWCC 3 Gaited Country Adult and WC 3 Gaited Country Adult Div. II. 2012 UPHA Country Pleasure Adult Horse Of The Year. 2013 Des Moines Springfest 3 Gaited Country Adult Grand Champion. 2013 Bonnie Blue 3 Gaited Country Adult Grand Champion. 2013 Midwest Charity 3 Gaited Adult Grand Champion. 2013 Blue Ridge Classic 3 Gaited Country Adult Grand Champion. 2013 Asheville Lions Club 3 Gaited Country Adult 18-35 Grand Champion. 2013 UPHA Country Pleasure Adult Horse Of The Year. 2014 J D Massey 3 Gaited Country Jr. Ex. Grand Champion. 2014 Blowing Rock 3 Gaited Jr. Ex. 14-17 Champion. 2014 UPHA Horseman's Classic 3 Gaited Country Pleasure Jr. Ex. Grand Champion. 2014 Lexiington 3 Gaited Jr. Ex. Grand Champion. 2014 ASHAV 3 Gaited Country Pleasure Jr. Ex. Grand Champion. 2015 Gasparilla 3 Gaited Country Pleasure Jr. Ex. Grand Champion. 2015 Asheville Lions 3 Gaited Country Pleasure Jr. Ex. Grand Champion. 2015 Blowing Rock 3 Gaited Jr. Ex. 14-17 Grand Champion. 2015 Lexington 3 Gaited Jr. Ex. Grand Champion. 2015 Kentucky State Fair World's Champion of Champions 3 Gaited Country Pleasure Championship and World's Champion 3 Gaited Country Pleasure Jr. Ex. 14-17. 2015 N C State Fair 3 Gaited Country Pleasure Jr. Ex. Grand Champion. 2015 UPHA Country Pleasure Jr. Ex. Horse of The Year. 2006 Bridgeman's King Friday- (Bay Gelding by Winsdown Celebration) 2006 Northwest Futurity Amateur Weanling Reserve champion. 2010 Central States Fine Harness Reserve Grand Champion. 2011 IASHA Spring Warm Up Fine Harness Amateur Champion. 2011 Heartland Classic Fine Harness Reserve Grand Champion. 2012 Heartland Classic Park Amateur Reserve Grand Champion and Park Amateur Champion. 2012 Blue Ribbon Fall Classic- Park Amateur Reserve Champion. 2013 Hardin County Park Champion. 2007 Bridgeman's William Tell- (Black Gelding by Plum Street Jazz)- 2012 Missouri State Fair 5 Gaited Amateur Reserve Grand Champion. 2015 Missouri State Fair 5 Gaited Show Pleasure Reserve Grand Champion. 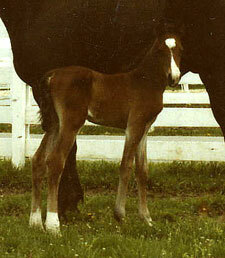 1997 The Line Of Fire-(Bay Gelding by The Silver Lining) 2000 River Ridge 3 Year Old Fine Harness Champion. 2002 River Ridge Open Fine Harness Champion and River Ridge Fine Harness Champion. 2008 Mid-South Spring Premiere Country Driving Grand Champion. 2008 Chattanooga-Cleveland Charity Country Driving Grand Champion.